Dla osób żyjących w dużych miastach balkon spełnia w pewnym sensie funkcję zastępczą dla przydomowego ogródka. Można tam posiedzieć przy lampce wina, posadzić zioła czy kwiaty, zrelaksować się na leżaku na świeżym powietrzu. Dodatkowo, jeśli mamy gości, którzy palą, nie trzeba ich wyganiać na zewnątrz, ani (o zgrozo!) pozwalać im palić w środku. Stąd właśnie, gdy kupowałam moje mieszkanie, balkon był jednym na liście punktów obowiązkowych. Przez dziesięć lat mieszkałam bez balkonu i wiem, co to oznacza – nie polecam. Jako, że nadchodzi wiosna i w końcu zamierzam udekorować mój nowo zdobyty balkon, postanowiłam zebrać tutaj garść wskazówek i inspiracji dla tych, którzy planują podobny projekt. For people living in cities the balcony is a kind of substitute for a garden. It’s a place where you can enjoy a glass of wine there, grow flowers and herbs, relax in a reclining chair while getting fresh air. Additionally, if you have smoking guests over, you do not have to make them leave the building every time they need to smoke, nor (God forbid!) do you have to let them smoke inside. 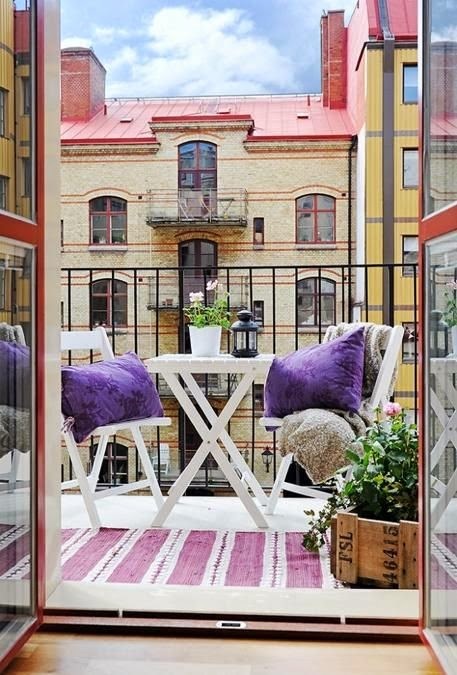 This is why, when I was flat hunting, the balcony was one of the top points of my obligatory flat feature checklist. I have lived in an apartment that did not have a balcony for 10 years – I do not recommend it. 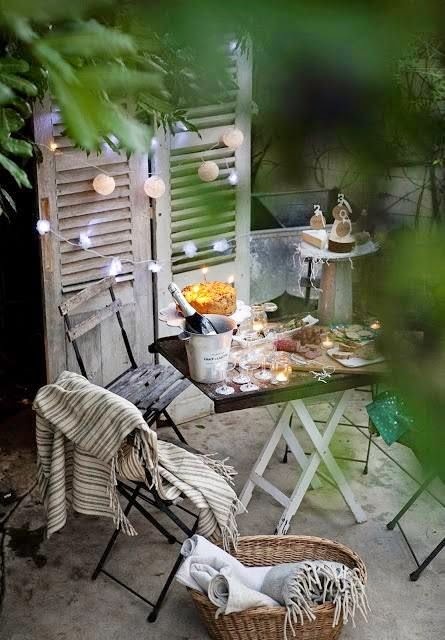 Since springtime is upon us and I intend to finally decorate my newly acquired balcony, I decided to collect a bunch of tips and inspirations for those of you who have a similar project coming. Podłoga na balkon – co wybrać? When it comes to the balcony floor, there are a couple of options. The first one is to just leave the floor that came with the flat. Usually this means ceramic tiles. This applies mainly to blocks of flats that have been recently built, older buildings may sport a balcony floor that is far from pretty. Personally I do not like the feel that the cold ceramic floor has on my feet - it makes it necessary for you to wear slippers or shoes every time you walk out onto your balcony. And it is not “cozy”. Of course a ceramic or even concrete floor can be covered with a rug to make it a bit warmer. However, this isn’t very practical – one of those interior design ideas that look great on a picture and worth leaving just there. Especially if you live in the kind of climate I live in (Poland), where it rains a lot. I cannot imagine taking the rug off the balcony every time it rains and then putting the rug back out once everything dries up. Popularną obecnie opcją są też podłogi z tworzyw sztucznych imitujących drewno. Jednak moją ulubioną podłogą na balkon jest zdecydowanie naturalne drewno. Nie tylko dlatego, że taka podłoga jest ciepła w dotyku, więc można chodzić po niej nawet boso, ale też dlatego, że jest po prostu ładna. Takie podłogi dostępne są albo w postaci desek, albo tzw. „podestów” czyli płytek montowanych na zasadzie puzzli. Oczywiście i tutaj występuje problem odporności na wodę, ale też i na duże nasłonecznienie (ja akurat mam wystawę północną, więc ten drugi problem nie dotyczy mnie w tak dużym stopniu), stąd trzeba uważnie wybierać drewno. Dobrze sprawdzają się gatunki egzotyczne (np. badi, bangkirai, cumaru, ipe, massaranduba czy tatajuba), ze względu na to, że są tłuste i mają stosunkowo dużą twardość, ewentualnie krajowe drewno drzew iglastych impregnowane pod ciśnieniem. Ważne jest też to, że drewnianą podłogę można układać na balkonach, gdzie spadek podłogi wynosi przynajmniej 3%, aby woda mogła swobodnie odpływać na zewnątrz. 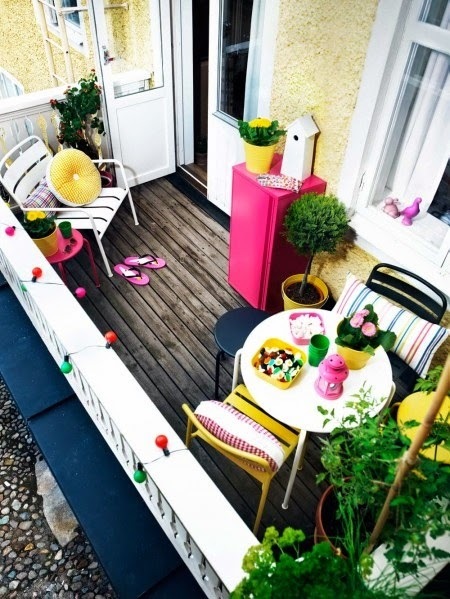 Balcony floors made of polyurethane or some other kind of plastic that imitates wood are also a popular choice. My favorite balcony floor is most definitely natural wood. Not only because this kind of floor is warm to touch, so you can even go on your balcony barefoot, but also because it looks really nice. Wooden floors come either in the form of boards, or wooden tiles that click together like puzzle pieces. Of course, we go back to the problem of water resistance, as well as the influence of sunlight (I myself have a flat that looks out to the north, so the problem does not really apply), so it is important that you choose the right kind of wood. Exotic trees (such as badi, bangkirai, cumaru, ipe, massaranduba or tatajuba) are your best shot here, as they are both greasy and hard. You also have to remember that you can only lay a wooden floor on your balcony if the floor level on the balcony drops by at least 3%, so that water can flow out freely. Just as in the case of balcony floors, also in the case of furniture there are a couple of options. If you are aiming for a comfortable, glamour feel, it is a good idea to go for furniture made of rattan or its more “practical” version – technorattan (a polyurethane imitation of rattan). 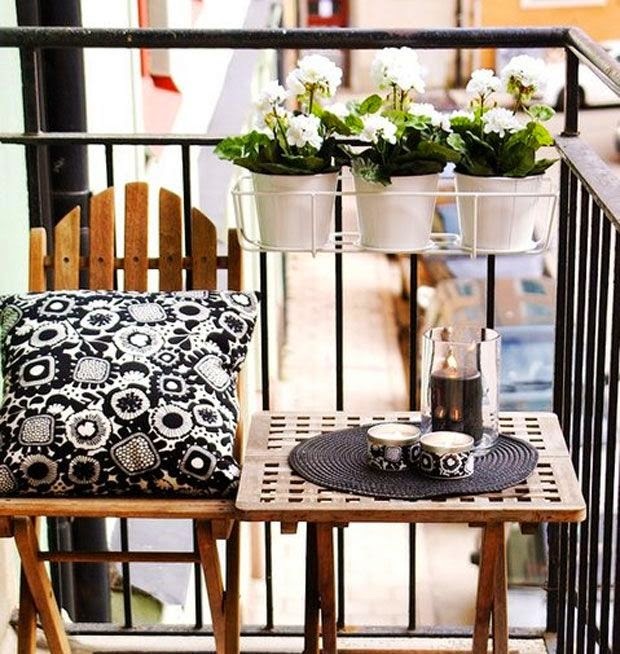 With crème cushions this kind of furniture gives your balcony a very elegant touch. If it is a Southern-European feel that you want to achieve, metal chairs and tables are a recommended choice. 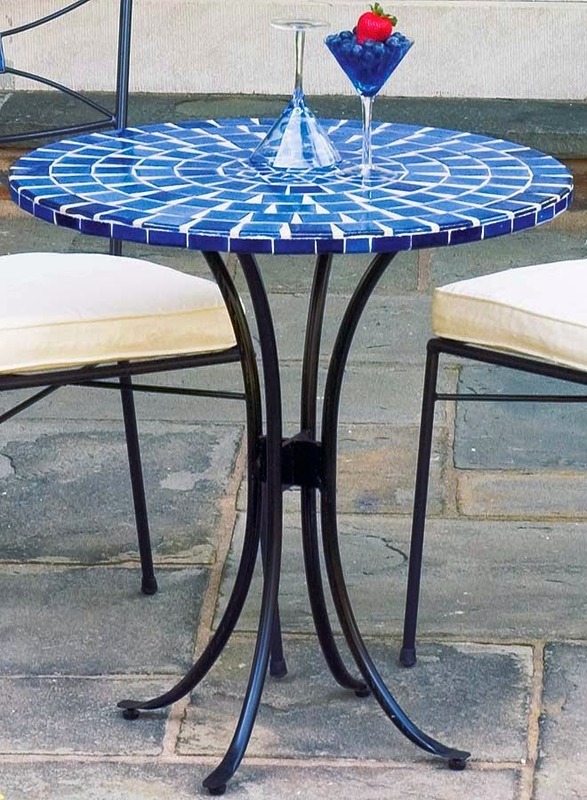 As much as in the case of chairs I am far from being a metal fan, I love metal tables, especially ones with a mosaic countertop – it can add a kind of Mediterranean vibe to any balcony. Of course, being a wood fan, I could not forget wooden furniture. In fact, I got wooden chairs for my balcony last year, but I do not think I will be using them once the season comes. 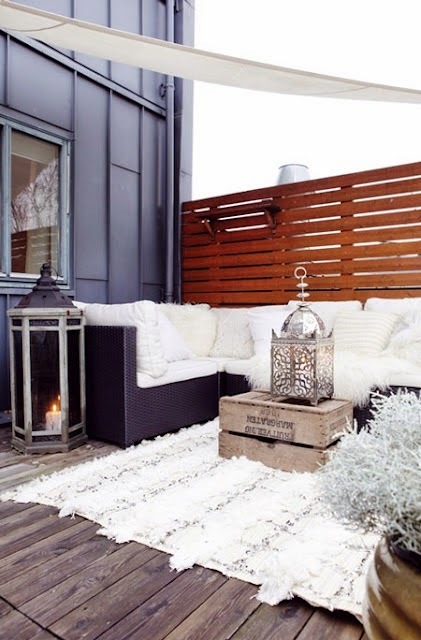 First of all, because of the weather (they are not made of any exotic wood), secondly – because I think I will opt for comfort and go for a rattan sofa with cushions. Then of course there are many other options such as net reclining chairs, plastic garden chairs etc. In general I wouldn’t go down that road – it’s neither comfy, nor pretty. 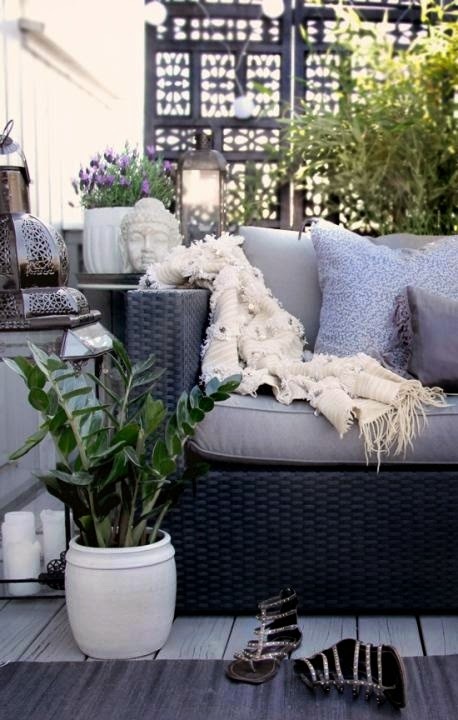 I really like a glamour, oriental feel of the first two balconies below, which you can easily recreate using Moroccan lanterns or Buddhism-inspired accessories. I am also very in favor of putting cushions on the balcony for an even more glamorous feel and encourages to relax in that space. Of course this problem only exists in blocks of flats, but in fact this whole blog is about decorating city interiors (since I am not an enthusiast of the suburban dream, writing about it would not be convincing). I have a balcony in my flat that is just next to another one, that of my neighbors. This is why I am wondering how I can visually separate myself from them. I am fortunate to have a neighboring balcony only on one side, which does make things a bit easier – I do not imagine building walls on both sides of my balcony. 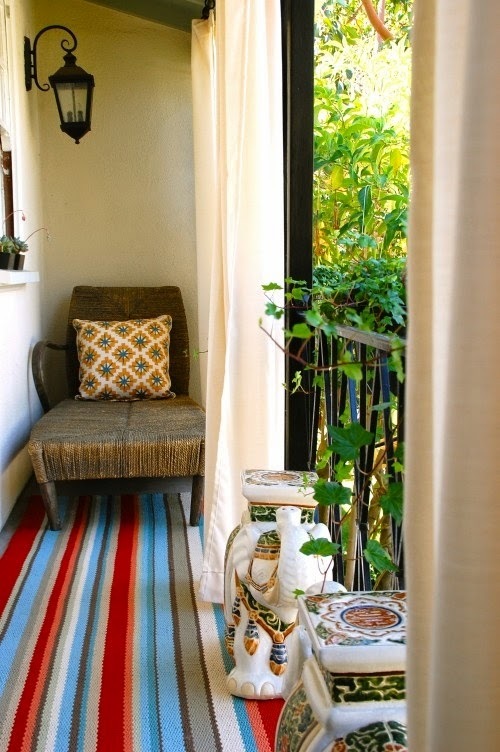 There are a couple of ideas you can use to get some balcony privacy. You can plant some cypress trees or ivy. However, they not only do not cover you completely, you also have to wait a bit before they get big enough to cover you at all. This is why I personally opt for solutions that are less transparent, such as screens of various kinds or another interesting solution – fabric curtains. The first option gives a more natural / rustic feel, the curtains are elegant and will nicely complement e.g. rattan / technorattan furniture. I really love the screen made from an old wardrobe door on the first picture below. Plants give your balcony the feel of a city garden I mentioned before. 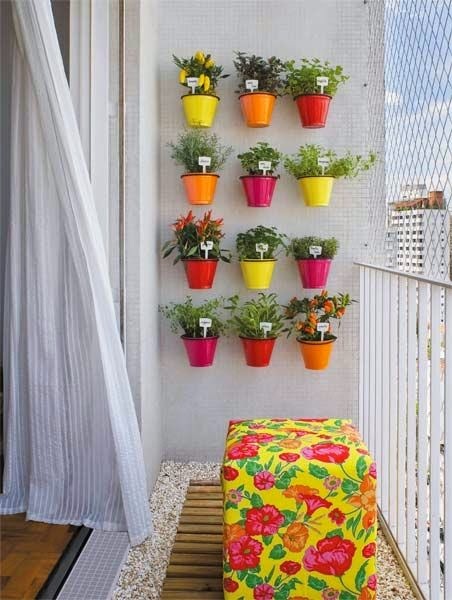 They not only decorate, but can also be practical if you grow herbs. Your invention here can be limitless. Starting from what you are going to grow – flowers, herbs, maybe both – through various kinds of pots and boxes, to where to put your plants – hanging down, standing on the floor or hanging from the balustrade? 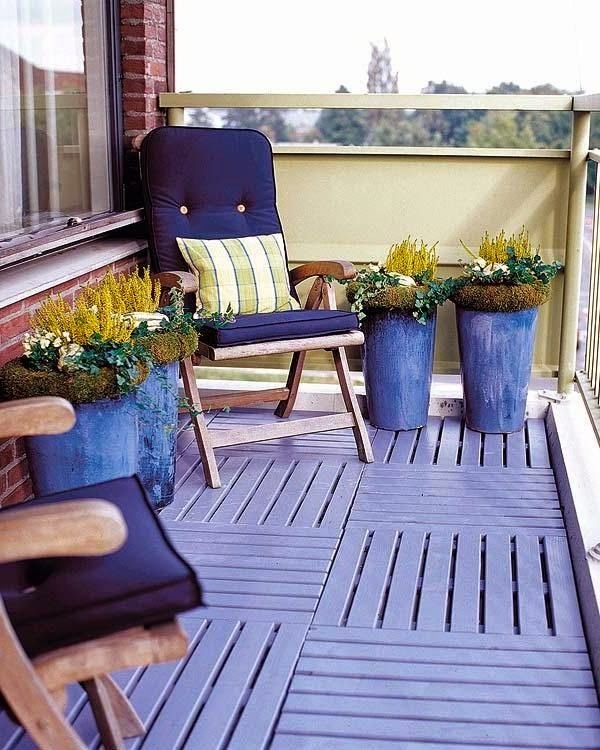 Below you will find some of my favorite ideas for balcony plantations. 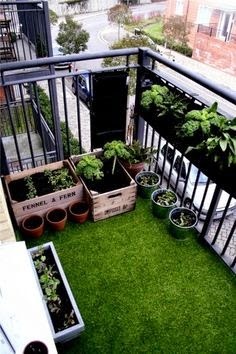 I especially like the idea to use old wooden crates as flower boxes, as well as the one with flower pots placed on the balustrade. Świetny wpis i inspiracje ! Bardzo na czasie, bo ja właśnie też siedzę w pomysłach balkonowych. Pozdrawiam. Drewniana podłoga na balkonie bardzo mi się podoba, ale jakoś nie jestem do niej przekonana. Jednak taka podłoga na balkonie jest narażona na czynniki atmosferyczne, więc szybko może wyglądać po prostu brzydko. Ja mam akurat zadaszony balkon (nade mną jest balkon sąsiadów), więc podłoga nie będzie aż tak narażona na działanie wody. Pewnie gdyby nie to, decydowałabym się na jakieś tworzywo imitujące drewno.